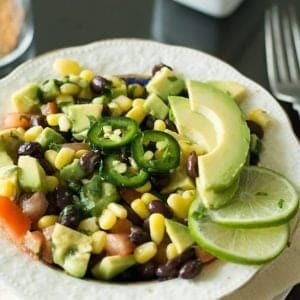 Black bean corn avocado salad with lime cilantro dressing, a bright, refreshing salad for serving as a side or appetizer. A tremendous effortless addition for weeknight dinners or game days. A vegan, paleo, gluten free and low carb dish made with vegetables and beans. I firmly believe that the weeknight dinners need not be complicated. And delicious meals are possible even with simple recipes. I have got a handful of recipes to prove my statement. And this black bean corn avocado salad with cilantro lime dressing with one such cute example. Black bean corn avocado salad has a special place in my ‘most favorited’ list. And It is will stays there forever. A recipe gets closure to the heart is for many reasons. Maybe the time it consumes for making or maybe its taste. Sometimes the cost also plays a crucial factor in deciding to be the favorite. Here, I could not come to any conclusions that what made to like this salad the most. But all these factors plus my family’s appreciations towards this salad made me like this the most. If you’re here in my website for a while, you might have noticed that of late I’m sharing the low-carb recipes. I’m focusing on reducing my weight by at least by 10 pounds. I’m not a strict low carb diet follower, but I make sure that I have a low carb menu for a meal in a day. This is working out for me and I’m halfway through my success. I’m hoping I continue to control the diet to reach my goal. There are many ways to serve this salad. This can be served as a dip along with tortillas. This can go as the base for making the burrito. Or can be served as a spicy side dish for the outdoor barbequed food. At times, I have this in my sandwich. I like to have this salad in any form. 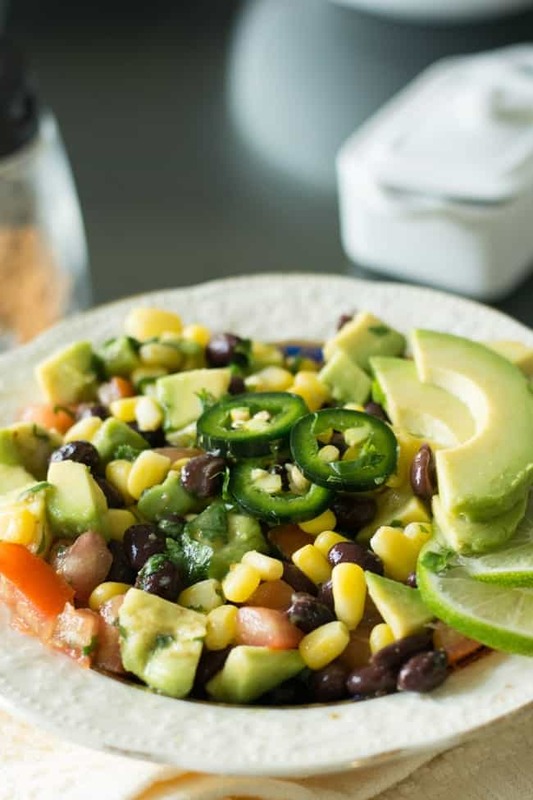 If you have a list for super quick recipes, then you definitely add this black bean corn avocado salad to yours. Are you are running out of time, and you expect the hungry children over the dinner table? Then without no further thinking, you can make this recipe if you have all these ingredients handy. On the same side, you will also have the full satisfaction that you have served your family with the healthy dish. What is the black bean corn avocado salad? This is a Mexican-inspired recipe, which is simple and straightforward. 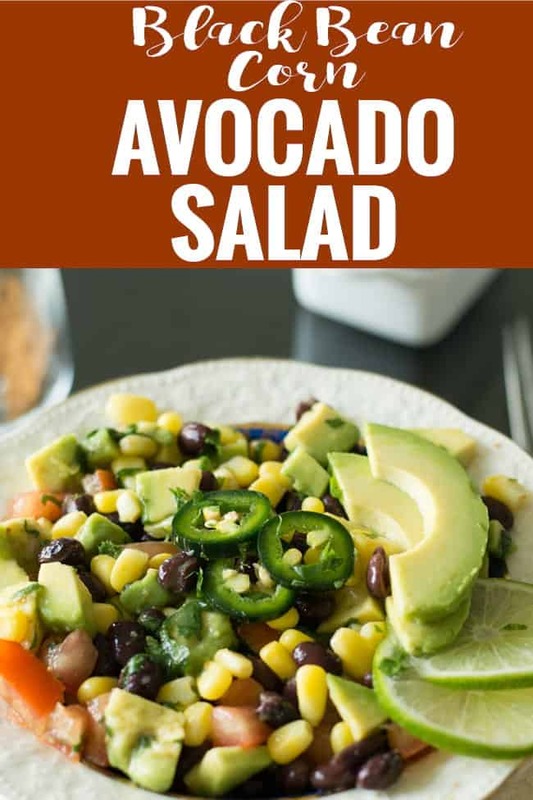 As the title by itself lets you know the ingredients, made with black bean, corn, avocado, jalapeno, lime, and cilantro. Made super quick if you have all the ingredients ready in hand. 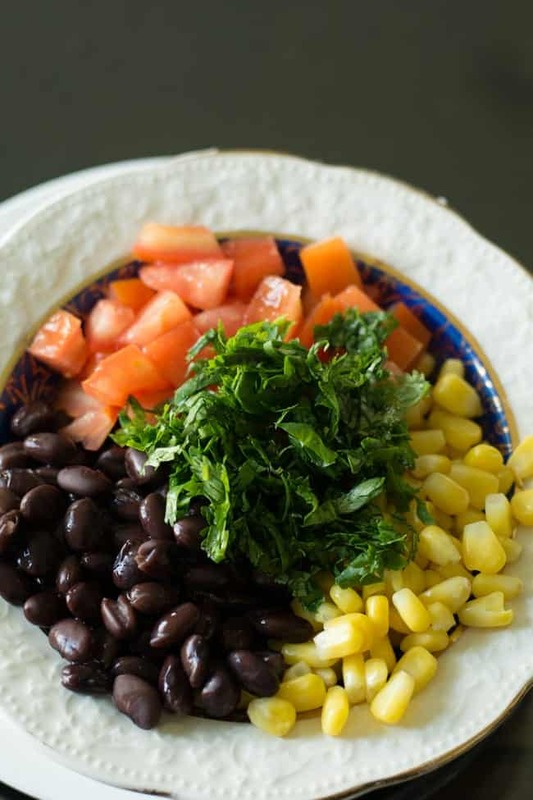 Why should you make this black bean corn avocado salad? It’s lightning fast recipe number. It’s a healthy, protein-rich, low carb diet. How does this black bean corn avocado salad taste like? If you have tasted Chipotle burrito before, you could definitely feel its bright flavors. Its aroma and taste is something similar to the salad of Chipotle. I give a big thumbs up for this salad since it is fresh and also it is healthy. And still, I can customize the taste according to my preference. How long black bean corn avocado salad can last? Avocado loses its color when it is stored for a longer time. So I prefer to consume as soon as it is made. If you have patients to take out all the chopped avocado from the salad, then you can freeze it or refrigerate. This way it can last for a day in the refrigerator. What goes with black bean corn avocado salad? This is a wholesome dish for me. And this energizing salad would be a great side salad for grilled dishes or a great dip for game day finger foods. I went with the canned black beans and frozen corn kernels. Getting these could cut down the preparation time for the weeknight dinners. 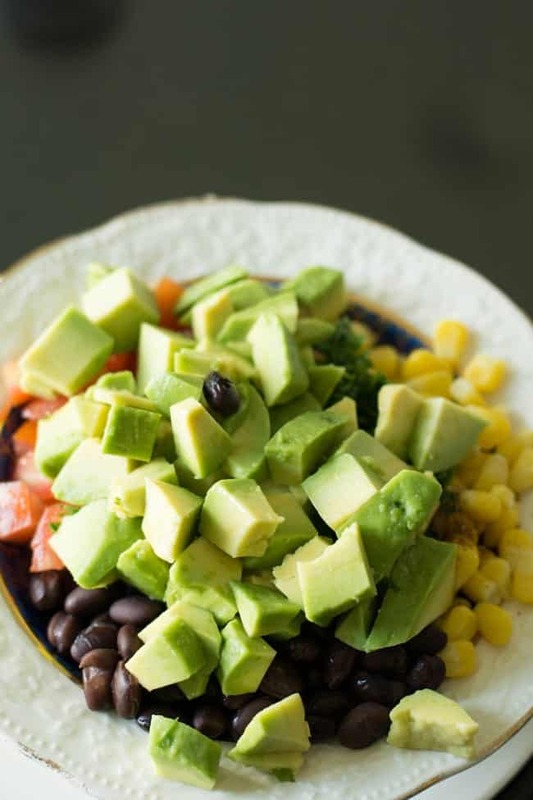 the key ingredients for this black bean corn avocado salad are the black bean, corn kernels, avocado, cilantro. 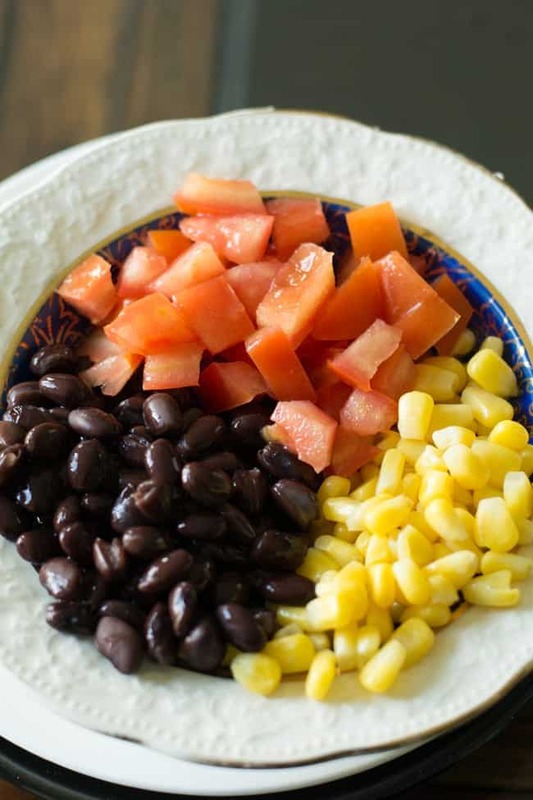 Black beans are available as dried, canned, Frozen and fresh. If you are using the dried bean, soak 8 hours. Then cook over the stovetop or instant pot or the slow cooker. The cooking time and cooking method vary for each of these on cooking method. If you are using instant pot, cook presoaked bean for about 10 minutes. If you’re cooking on the stove top, 3-4 cups of water along with a teaspoon of salt in the medium flame until it is cooked completely. If you are using the slow cooker to cook black beans for about 6 hours. You may check this post for a detailed report for cooking black bean. Since this is in season now, you may get fresh corn for $0.30 each. And at times you may get it for .20 as well. So this is a budget-friendly ingredient for sure. You may also use canned or frozen corn. Any version is good to use. You choose according to the availability and affordability. Add roasted cumin powder along with the lime juice to make it the lime-cumin vinaigrette. This gives a pure Mexican flavor to the salad. Add chicken to add protein. If you’re looking out to make something with a seafood, shrimp would be the best choice. The shape and the texture of shrimp make the salad look exotic. You are thinking something more to lime cilantro dressing? you might consider red wine vinegar, which is also a good option. You may add tomato, cucumber, carrots to give a refreshing look. And this adds extra crunchiness. Can I make black bean corn avocado salad with Italian dressing? Yes, this would be an awesome fusion recipe made with Mexican ingredients in Italian dressing. Black bean corn avocado salad lime cilantro dressing, a bright refreshing salad for serving as a side or appetizer. A great effortless addition for weeknight dinners or for game days. A paleo, gluten free and low carb dish made with vegetables and beans. Gently toss, until all the ingredients evenly coated with the lime dressing. If you prefer mild salad, deseed jalapeno before adding to the salad.